A Slurry pump is a type of centrifugal pump in physics principle that increases the pressure of liquid and solid particle mixture, through centrifugal force (a rotating impeller) and converts electrical energy into slurry potential and kinetic energy. There are 2 kinds of slurry pump, horizontal type and vertical type, for vertical type pump, there are submersible slurry pump and underwater pump. Submersible slurry pump is widely used for drilling fluids transferring, underwater pump is used for fluids transfer. Horizontal slurry pump is also used for drilling slurry transfer, just the installation method is different to meet different mud tank size. What is vertical slurry pump? Vertical slurry Pump is the cantilever pump structure of single stage and single suction, with the bearing housing, supporting, intermediate pipe connecting the pump hydraulic components, the water is discharged out from the drain pipe parts, pump impeller is for semi-shrouded with the agitating vane on the vane extended, the main characteristic of this pump is the underwater pump shaft parts have enough rigidity, the impeller and pump shell have no bearings, no shaft seal, which can transport the greater medium of solid particles. The length of inserting the water by pump is between 800 and 2000, the suction pipe can be matched in case of need. The shaft seal runs into the underwater pump without setting up the shaft seal, drive should be installed the vertical motor on the supporting seat connecting with coupling and pump. 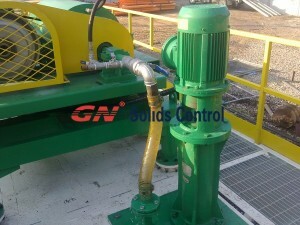 For horizontal slurry pump and vertical slurry pump price, pls contact GN solids control. Why is removing solids from drilling mud so important?